Do you want a safe, adjustable flexible tablet stand holder? BESTEK gooseneck tablet holder will be your first choice because of its amazing features. Can be used for office table, tea table, chair, beside bed and other places, bedroom, kitchen, office etc, perfect for watching videos. Applies to New iPad 2017/2/3/4, iPad mini 1/2/3, iPad Pro 9.7 inch/10.5 inch/12.9 inch and iPad Air 1/2, not fit iPad mini 4. Can be adjusted easily of different types of clamps, you can swivel for an optimal position or viewing angle, rotating and turning the gooseneck into "S" or "C" shape. No frills attachment mechanisms, a simple bracket, easy to assemble. To ensure safety of your tablet, it is designed into a durable, reliable and sturdy construction including sure-grip touch point, avoiding your tablet falling. 18 months warranty and provide friendly, easy-to-reach support, you can buy with confidence!. BESTEK 2 in 1 Hands Free Tablet Stand: A premium gooseneck tablet holder with 2 clamps which can meet your various needs for both iPad Pro 12.9" and tablet of 7-10.5 inch. 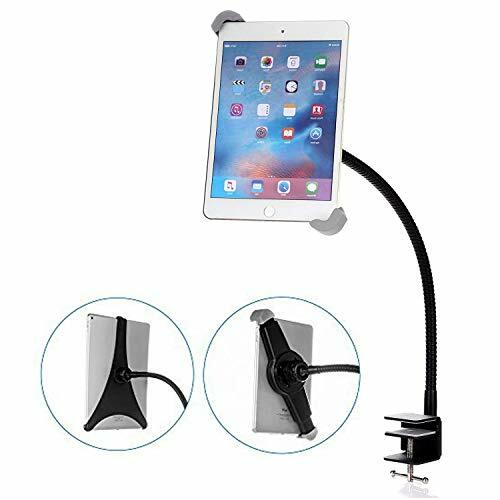 Adjustable Gooseneck Tablet Holder: Comes with a durable and flexible gooseneck, convenient to adjust for an optimal viewing angle position. Multiple Protections: Surfaces or edges can be well protected by one metal adjustable arm, two-way mounting clamp has soft rubber pads to prevent your furniture from scratch and wear. Simple to Install and Use: No drilling or tools required. Can be installed onto any desk, headboard, bed, wall cabinet or chair, tea table, beside bed, kitchen, office, etc. What You Get:1 x High quality gooseneck holder with two clamps, 1 x Step by step instruction manual, 18 months warranty and lifelong friendly customer service. If there is any problem with the product, feel free to contact us, we are ready to help! If you have any questions about this product by BESTEK, contact us by completing and submitting the form below. If you are looking for a specif part number, please include it with your message.